You are a creative storyteller with an obsessive passion for animation. You want to develop your technical skills and you love working with the latest technology. If you think this applies to you, then you should apply for this course. This degree is an amalgamation of animation and illustration. When we created the course we spoke to our contacts in the industry and asked them what the course should cover. As well as both 2D and 3D animation, the industry wants people who can draw… and they seem to be in short supply. For that reason, in the first year you will gain a solid grounding in illustration for animation. Using light boxes and rostrum cameras you will explore the traditional methods of animation, including the twelve principles of animation that have guided generations of animators. 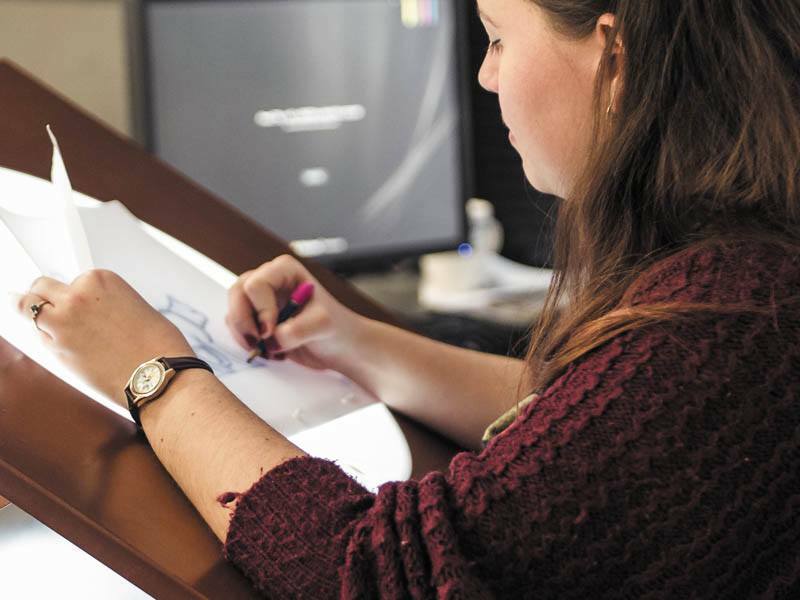 Creative thinking, storyboarding and story structure are all covered and within the first year you will put everything into practise with your own 30 second traditional animation. In the second and third year, while continuing to develop your illustration skills, you will become proficient into 3D digital animation, covering all the essential skills, including rendering, unwrapping, texturing, digital sculpturing and creating digital 3D worlds. You will also cover post production techniques including editing, layering, adding music and sound effects. The motion capture module will provide hands on experience of capturing, cleaning and using data captured using the mocap system. Your third year honours project will become the centrepiece of your portfolio and should reflect the area of animation in which you plan to specialise. There is also a theory-strand that runs throughout the course covering the historical and contemporary aspects of the subject, culminating in a research dissertation about the animation industry. By initially focusing on traditional 2D animation skills, the course produces more rounded and proficient 3D digital animators. The illustration aspect to the course makes it stand out from many digital animation degrees and you will enjoy the way we come together as a team to express stories in a fun, creative and exciting way. As you move on to the digital animation, you will be using the latest versions of industry standard software, like Autodesk Maya, together with the same hardware and workflows that you will find in the real world. The reason for this is that our tutor team are all industry professionals that either still work within the industry or contribute to current projects on a freelance basis. They feel that it is essential that you understand the way the industry work as soon as you start on the course. This highly experienced team of tutors is augmented with independent animators and professional comic book illustrators who teach specific specialisms and deliver guest lectures. Finally, all our students really appreciate the smaller class sizes at Futureworks. You can be confident that you will get plenty of one-to-one tutor time when you need it and our students often say that there is a real family feel to the course. In your final year, we will be focusing on your future career. We will develop your online portfolio and look at ways of marketing yourselves effectively in this predominantly freelance industry. During your time at Futureworks, you will have many opportunities to make career contacts and we will explore ways of exploiting those contacts, finding jobs and interviews and even work on interview technique. Students who complete this course can expect to find roles as Illustrators, storyboard artists, 2D or 3D animators and other roles within the animation industry. You could end up working freelance, within animation companies, post production facilities or other sectors of the creative industries.